Can there be any substitute for a well bound book? I doubt it! The new trend of e-readers will have it's day and then be gone, but a book bound by hand using the same traditional skills, techniques, and hand made materials has proven to stand the test of time. ...But also to the increased value his legacy has left behind. The book itself will have a value for it's scarecity and the binding can be just as valuable as fine art! ﻿The Private Investment Library is still increasing in popularity as the e-book will fade into the distance. There have been record prices in the last 10 years on the high end of the rare book market and overall still yields a healthy 12% return on investment per annum. Back in the day it was true to say that a gentleman's wealth and knowledge was measured by his library. And if I could but capture a shadow of the genius of the great Masters of the past millennia, then I know that my work will hold true for as many centuries as theirs, ensuring my clients investment is enjoyed by future generations. Not only for value it holds as a rare 1st edition, but also for it's greatly increased value as Fine Art. 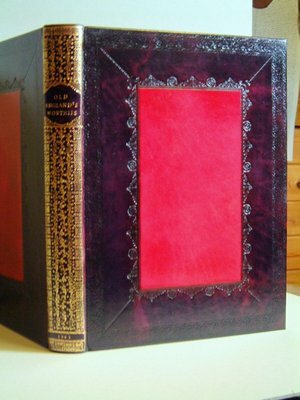 Period Fine Bindings re-create the sumptiousness and inspired traditional antiquarian bookbinding of the ages specializing in the scourcing, building, restoring, or/and re-binding of Private Investment Libraries. As you flip through the pages of my website you will come to the conclusion that condition doesn't really matter at all to me or my clients......who have often told me they would never buy rare books in very poor condition as they thought this level of conservation was impossible! Well it is possible and also affordable! Period Fine Bindings use unique conservation techniques that do not involve harmful chemicals, solvents or surfactants that compromise the fibres of the paper and medium. All of my formulae are derived from harmless plant extracts unique to my work only, ensuring that badly damaged books are restored to museum quality.....and that they retain their true high end value. Next Page Book binding & The "Cambridge" Panelled Calf.